This shot is my favorite running picture of all. 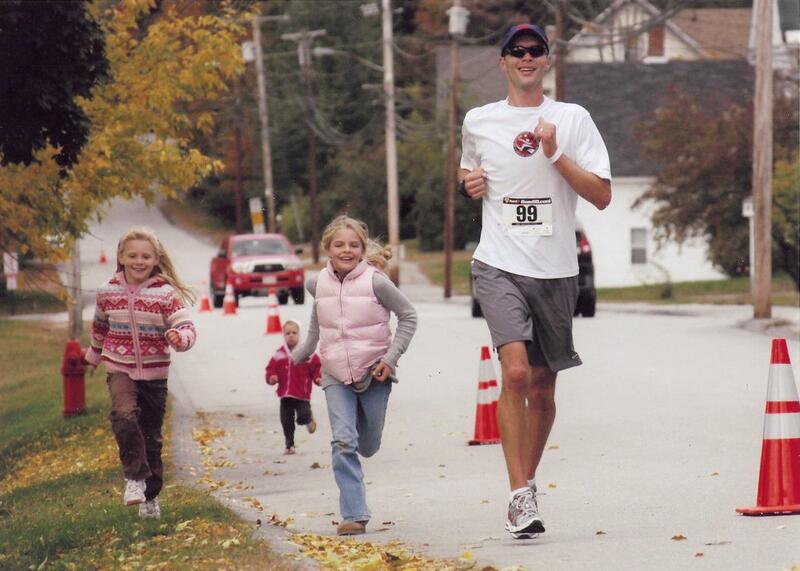 It was taken by the course photographer right at the end of the NH Marathon. I posted a similar picture last October, but it didn't have Zoe it in, and it didn't catch the expressions on our faces. I think I can make out a look of frustration on Zoe's face...she tried really hard to keep up. The other night I had a dream that my Boston qualifying race had come. For some reason it wasn't the CO Marathon, but some other race and I have no idea where it was. Anyway, for some reason I was very late getting to it. When I arrived, I absent-mindedly put the envelope containing my race bib and timing chip aside and just hopped into the race. Boy, did I run a good time. I was approaching the finish and happily looked at my watch and knew I was about to qualify. For some reason this was also the time I realized that without a timing chip, I would not receive an official time and thus my effort was worthless. Most nights I sleep quite peacefully. This particular night, I woke up breathing heavy, panicking, heart-broken, angry for not wearing my chip...and with a light glaze of sweat covering me. You better believe that timing chip will be on securely on May 3rd!